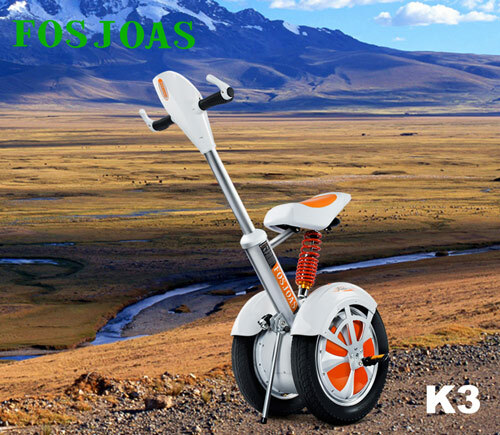 FOSJOAS K3 two wheel self balancing scooter is a veritable credit to Moben Global Inc. It was released in the year of 2015. At the event where FOSJOAS K3 was unveiled, it came under the spotlight and became the highlight of the whole new product release announcement. Alex attended the festival event, who witnessed the whole process of K3 release. He was deeply impressed by the dashing and stylish design of FOSJOAS K3. The two-wheeled intelligent scooter K3 is equipped with a leather saddle. The sit-on mode of ride is the most obvious draw. At the moment, an impetus to buy it surged Alex. It is still not available for purchase in the market then and therefore Alex did not get it. Months later, every store and online store commenced to sell FOSJOAS electric scooter K3. Alex jumped in and placed an order for one set of FOSJOAS K3 online. In spite of his quick move, it was still out of stock online. Alex had to go on to book it and he took the delivery two weeks later. The belated arrival of the precious K3 still amused Alex. He at once had a go at it. He steered it in the square of his neighbourhood. The leather saddle is a main draw and selling point of FOSJOAS K3 self-balancing scooters. The comfortable saddle offers a cosy ride. Alex rode it for 3 hours at stretch, but he did not feel a shred of fatigue. The considerate design of saddle saves the energy of the rider and concentrates their attention on enjoying the fun of ride. Additionally, the brake system appealed to Alex. This is also a design different from the other models. Alex activated the brake system not merely by standing upright but also pressing the button of brake. This design is a thoughtful doing which meets the demand of beginners who have no time to brake by standing upright. The brake system enhances the safety during ride, especially at critical moment.